Ravenwood Owner J.D. Sadler and Vice President Tyler Peters wanted to bring a premium Sporting Clays shooting experience to Southeast Alabama. In early 2015, they opened the gates to their 43-acre course, complete with a newly constructed clubhouse, pavilion, and lit warmup and practice shooting area, among other amenities for hosting events. "I don't play golf, but I do like to shoot," says J.D., who became a Sporting Clays enthusiast while living in Tennessee. "We wanted to have a safe, welcoming place where we could bring our family or business clients for a friendly, competitive outdoor sport." 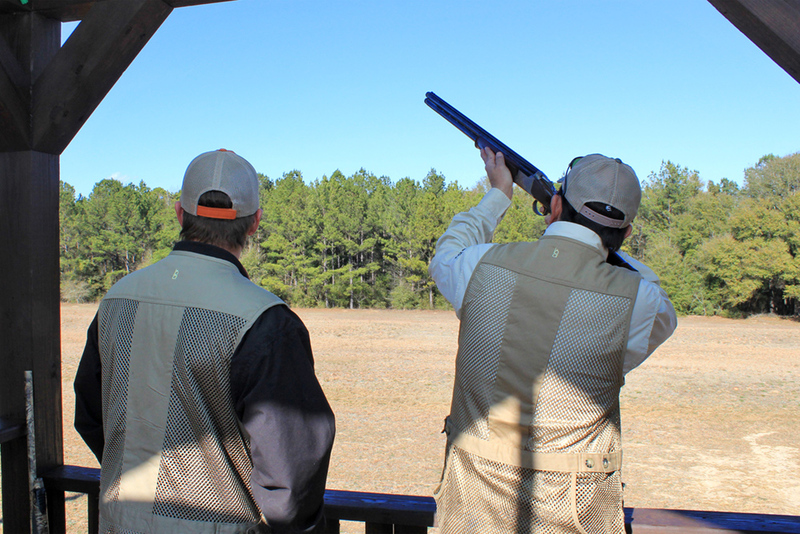 While sporting clays is entirely new to the Wiregrass area, it's a very popular shooting activity in many parts of the United States. J.D. and Tyler know that local hunters will especially appreciate the sport. "Every time a hunter gets up early to spot birds in a field, he knows might not even see three birds that day," says J.D. "At Ravenwood Sporting Clays, we guarantee you'll get to shoot as much as you like, and you don't have to get up early to do it!" Ravenwood also caters to younger shooting enthusiasts. Many youth organizations, schools, and colleges are forming Sporting Clays teams. Both J.D. and Tyler enjoy teaching beginners the safe way to handle, load, and use shotguns. "Ravenwood is perfect for beginners because we've got a very safe, controlled environment for them to learn how to shoot," says Tyler. "And we've got a broad array of rental guns to fit each shooter, regardless of age or size." J.D. and Tyler invite curious sportsmen to come try out this fast-growing sport: "We can't promise that you'll hit every target, but we do guarantee that you'll have a great time trying!" "We wanted to have a safe, welcoming place where we could bring our family or business clients for a friendly, competitive afternoon." "We can't promise that you'll hit every target, but we do guarantee that you'll have a great time trying!"